Premier, #1 Chicago board up services to call incase of fire, flood, weather damage, water damage, vandalism, car crashes, emergency, diasater or for any reason you need to secure your residence or building rapidly and confidently, including broken glass replacement, water removal from basements, tarp and tar roof damage, temporary electric, debris removal and winterization. We work with your insurance company and bill insurance companies directly. We are the industry leader of emergency board up services in Illinois, Chicago and Chicagoland area by insurance companies, insurance adjusters and our satisfied customers. 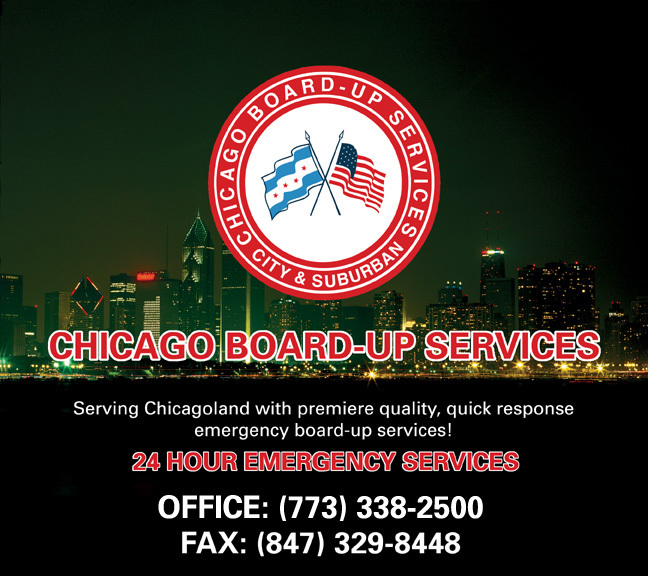 Chicago Board Up is a fully licensed & bonded in IL. Dedicated to providing our customers with complete peace of mind & satisfaction. The quality of our materials, workmanship & experience far exceeds our competition. We meet All licensing requirements from the city of Chicago. Also check out our Chicago Board Up Better Business Bureau profile. All contents, artwork and photography ©2007-present. Chicago Board Up, all rights reserved.